I’m still puzzled some days how I survived the first 28 years of my life before I learned how to cook. 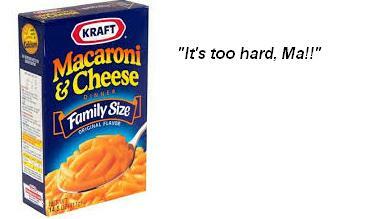 My sister is quick to remind me of the time we lived together right after I graduated high school, and I couldn’t figure out how to make Kraft mac ‘n’ cheese from the box, so I called Mom for help. I honestly do not remember this, but I see no reason for my sister to make up such a ridiculous story…and it sounds like something I’d do anyway. Fast forward five years to my Oscar party about a week and a half ago, where I was making everything on the menu from scratch – three meat lasagna (says the vegetarian, nonetheless), bruscetta, stuffing for the hors d’oeuvres, and cookies. What…the hell…happened? I honestly have no idea why I resisted learning for so long. Growing up, I spent a lot of time with my grandma, who was an AMAZING cook, but I didn’t realize at the time how much she wanted to share that knowledge with me and my siblings. I do remember recipes Mom used to make that I still crave now – namely, her meatloaf and her pork chops. Mom says she’s not a good cook, but that’s like hearing Picasso say he wasn’t a good artist. Mom just didn’t cook *enough*, probably because she didn’t want to compete with Grandma. If you put Michael Jordan up against LeBron James, someone has to come out on top, but that shouldn’t diminish the talent of the person who couldn’t edge out the competition for the #1 spot. Between Mom’s meatloaf and Grandma’s elderberry pie, it’s no small wonder I was a pudgy kid. But I really took it for granted that I had good women cooking around me, and never felt it necessary to learn anything from them at the time. For shame, because I’d give anything to have a cooking lesson with Grandma now. I didn’t want to miss an opportunity to know Mom’s secret to her meatloaf, so a few years ago (before I gave up meat again) I asked Mom about the deliciousness she served us oh-so-many years ago. “Oh, my meatloaf? That’s nothing special, you don’t need that.” Oh, but I do! Why won’t you tell me? *long pause* Come on, please?!?!? *giggle, giggle* “Do you really want to know?” Yes, Mom. What’s the secret? She finally told me her formula…and I realized why she was giggling during the entire conversation. WHAT??? My mom was more of a genius than I ever knew!!! She had me fooled, she had us all fooled! While I watched her make that loaf of meaty goodness all those years ago, the entire time she was using peripheral vision to read the ingredients from the can. *sigh* But even those who can borrow recipes from the big conglomerates can still throw in a curveball that makes it better than the original print – and my memory served me thusly. I remember Mom used Ritz crackers in her meatloaf, rather than rolled oats or those dry sheets of salty cardboard we eat when we have the flu (Saltines). 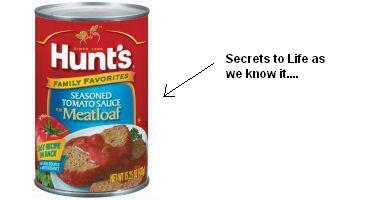 That alone makes Mom’s recipe better than what’s really on the back of the Hunt’s meatloaf sauce can. That gave me hope that sometimes it isn’t about being 100% original, it’s about putting your own signature on it to bring it to perfection. I think it was out of necessity that I learned to cook. Dating isn’t easy when the only thing you have to offer is making the Kraft mac ‘n’ cheese after Mom gave her advice (which was, of course, “boil water and read the instructions, dumbass”). I also have to thank the Food Network, and my hero Alton Brown. He wasn’t just a chef, he made learning about cooking fun with his diagrams, puppets, and self-deprecating humor. The intimidation of the Barefoot Contessa was no match for my willingness to learn a new art form with the knowledge from Mr. Brown that cooking can, in fact, be fun. My first attempt at cooking from scratch wasn’t all that great, but it was a start. Since then, I have used trial and error and secrets of Grandma’s masterpieces to create a handful of receipes on my own. Once I gave up meat and dairy, I got to start all over again, tweaking old recipes to be vegan…which can promote epic failure at times. But thanks to Google, I usually can find a good way to substitute ingredients without compromising flavor. Which brings us to this coming weekend…Sunday I am cooking one of my old favorites for my boyfriend’s birthday: crab stuffed manicotti. If you’d asked me 6 years ago whether I could see myself making a dinner like this without any fear, I’d consider that crazy talk. Yet, I am looking forward to it! I do see cooking as a form of art, and I enjoy sharing art with my friends and family. Haha I considered myself doing well in college when I’d add frozen veggies to Mac and Cheese. Good story.